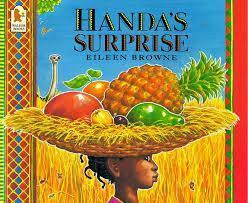 Handa's Surprise - this is the story of Handa, who's part of the Luo tribe in south-west Kenya. Handa decides to take seven pieces of delicious fruit to her friend, Akeyo, who lives in the neighbouring village. But as Akeyo wonders, I wonder what fruit Akeyo will like best?, a series of sneaky animals steal something from Handa's basket, which she's carrying on her head... When Handa reaches Akeyo, will she have anything left to offer her friend? Before reading the story, look at the title and cover. Predict what the surprise might be. Then, read the blurb on the back cover? does this give any more clues about the surprise? The story is full of questions. Look at the use of question marks in the story. Can you write your own questions and put a question mark in the correct place? Retell the story in the form of a storyboard with captions and speech bubbles for each character / animal. Rewrite the story from Handa's point of view. What does she think happened to the original fruit in her basket? Make a list of vocabulary to describe the animals and / or fruit that appear in the story. Write a review of the story, giving your opinions about what you liked / didn't like. Try to make a similar story where a child organises a surprise for somebody else, but there is a surprise for them at the end of the story. Weigh a selection of different fruit and vegetables. Can you put them in order from lightest to heaviest? Gather some fruit and use this for data handling activities… What is the favourite type of fruit in the class? Make a graph to show how far each type of fruit has travelled from its country of origin. What is the average number of grapes in a bunch? Find out about the fruits Handa gathered for her friend. What vitamins do they have in them? Find out about the animals that appear in the story. Where do they live? What do they like to eat? Could you act out the story and take digital photos to retell it? Collect some fruit and vegetable into a basket and draw it. What colours / textures will you need to show? Draw a map showing Handa's route to see Akeyo and add pictures which shows the events which took place along the way. Research where the fruit in Handa's basket comes from. You could also look at the packaging / labels of fruit in your local shops. Where is the country of origin for each type? Can you plot these on a map? Can you find out the names for each fruit or animal in a different language? If you were going to collect some gifts for a friend, what would you give them? What surprises have people organised for you? Can you think of a nice surprise that you could arrange for somebody else? 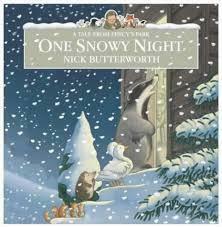 One Snowy Night - Percy the Park Keeper helps his animal friends in this popular story from highly-regarded, best-selling author-illustrator Nick Butterworth. Includes a fabulous fold-out poster! Percy’s hut is nice and warm but Percy discovers that if you invite one animal in you’ll have to invite them all in and his hut is only small it’s certainly going to be a squash!